Shadow Lake outlet granite block and earthen dam headwalls approximately 129 feet long with gatehouse and wood catch fence in front of principal spillway. Concrete emergency spillway built in 1929 to the left. 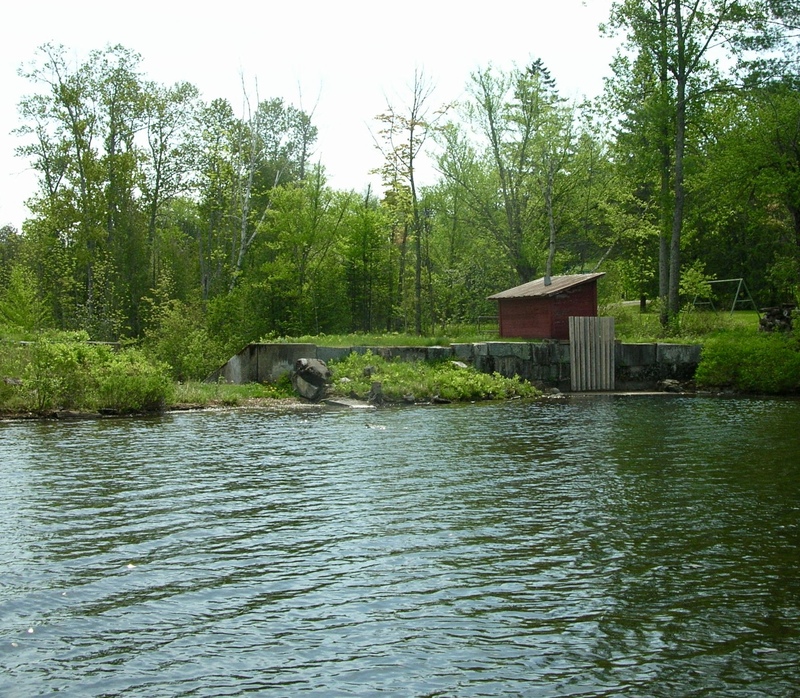 The first dam at the outlet of Shadow Lake was built by Eli Gray about 1828. He had purchased the 160 acres of original Lot # 57, which included the outlet end of the lake, in 1823 for $100. The saw and grist mills which he built on the site are first mentioned in the Glover land records in 1837 when Lot 57 is sold to Warren S. Clark and described as “the lot which Eli Gray now lives on” and where the sawmill and gristmill known as Gray’s Mills are situated at the outlet of Chambers Pond (now Shadow Lake). In a 1906 letter to the Orleans County Monitor, George W. McGaffey, a later owner of the mills, wrote that he remodeled the sawmill in 1868 when it was 40 years old. He took out the “old upright saw and wooden wheel “ and put in a “circular [saw] mill and iron turbine wheel”. This would date the construction of the mill to 1828. There was controversy about the safety of the old dam in the 1870’s and mill operations were closed for a time while a lawsuit worked its way through the courts. The existing granite block and earthen dam may have been rebuilt or newly-constructed in 1906. There are references to work being done on the dam in the local newspaper but no certain records of exactly what was done at the time. The dam survived the Great Flood of 1927, though the possibility of its failure caused concern to local residents and a team of men worked to reinforce it with sandbags. Shadow Lake granite block and earthen dam backside, viewed from below the lake, gatehouse principal spillway on left with 1929 concrete emergency spillway (33 x 15 feet) to the right. The existing concrete emergency spillway is dated 1929 and the principal spillway and gatehouse look to be of similar age. 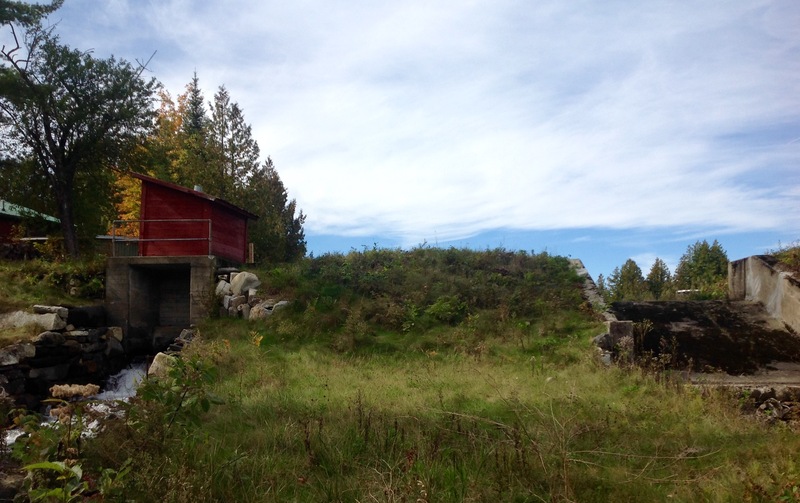 The dam was used to impound water for the last remaining sawmill, located near the intersection of Shadow Lake Rd. and Route 16, until about 1940. The gate was opened in the morning to allow water to flow down to the mill and closed again at the end of the workday. The gate is a heavy iron door, which slides upward when a large wheel is turned, and opens a 36 inch diameter spillway. ~ submitted by Jack Sumberg, Glover, VT. 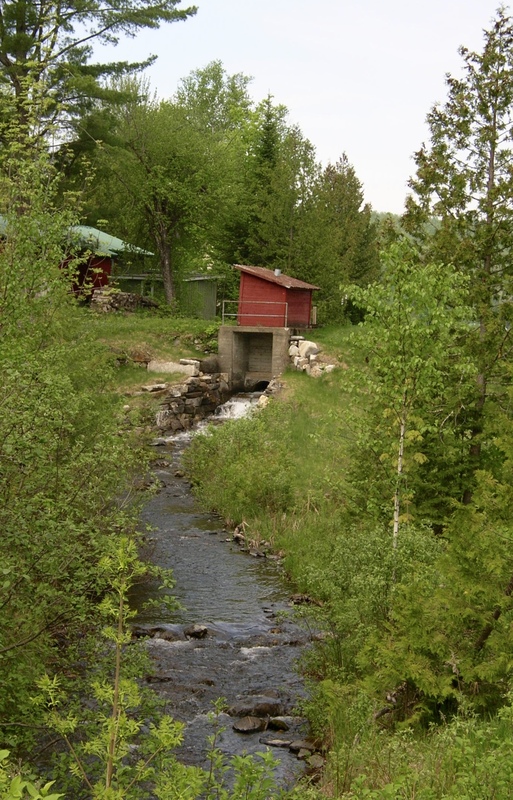 The dam facility is evaluated periodically by the State of Vermont.